Young Fiona, rider of the gold queen dragon Talenth, has just returned from three years at the abandoned Weyr (or dragon domicile) Ingen, to which injured dragons and riders had gone to heal. The place is 10 Turns in the past, yet only days have passed at Fort Weyr when they return. The Weyr (dragons, riders, and support) are still fighting Thread shorthanded because the plague is still killing dragons, and dragons and riders are going down in battle. Suddenly all Telgar dragons and riders are lost Between. Since Talenth is the oldest queen who isn't leading a Weyr, Fiona becomes Weyrwoman of Telgar, where she galvanizes the people and attracts dragon riders and healers to join. The constant Thread falls cause rapid attrition of dragons and riders, and the search for a cure for the plague and the fight for survival become ever more desperate. Adding fascination is the book's exploration of the possibilities of dragons going Between from one time to another just as they go almost instantly from place to place on the planet. 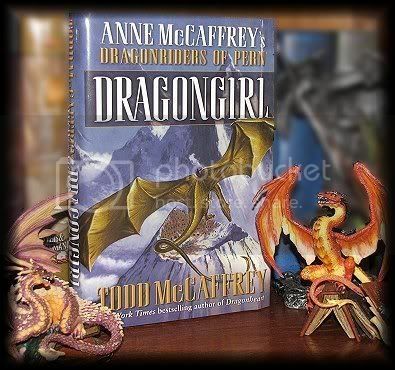 In the case of Anne McCaffrey's Pern books, I just never give up! The first few books her son Todd wrote were not up to Anne's but I keep getting them and reading them because (much like Pandora) I just don't want to leave! In other books I know part of the problem is ME. You see, Todd is "keeping the planet and dragons and weyrs" but letting go of Anne's fabulous characters from Benden like Lessa and F'Lar and many others like Masterharper Robinton, and Jaxom and Ruth... well...what can I say ? It's damn hard! So.. I got Todd McCaffrey's latest book, and I guess some of the characters are finally sinking in and becoming characters I like. (but it's taken a few books to do this) Anyway.. by page 140 I was thinking, "wow! I think he's finally getting it right! ", and I was really enjoying the book! But, (and I know you knew the "but" was coming)..as it went on I found myself thinking things I've never thought while reading a book before! Not that it was awful (it wasn't!) but it distracted me I guess. I would read that Fiona was in love with Harper Kindan but "mated" to another... and her mate was in love with another. (huh? male dream? one man two women sharing him??) Then I noticed it was pushed in my face many times over the rest of the book. Men sharing two women, a woman sharing two men... it brought down my feelings of the people of Pern. I think it was meant to bring love to everyone and that everyone can love each other, but it was too much in my face. Then he had the dragons letting others ride them without the one who impressed them. Again, under circumstances it was ok ... but it was being done over and over with too many dragons. He was changing too many things in one book. Needless to say the book that began so good and had so much potential still wound up disappointing me. Everything that he "changed" he repeatedly said it over and over and pushed it in my face... it was overkill. However, things ended on a high note for me... it seems the next book due out next year will be a collaboration with his mother Anne McCaffrey! I hope she can put him back on the right track! Changes are needed when someone else takes over, but then again some things really need to stay the same. If you are a Pern fan you should read this book... if for no other reason than to be able to know what's going on when next years book gets released. Grade 6 Up?Things are not what they seem in this story of wit, adventure, and philosophy. Gen, an accomplished thief incarcerated for stealing the king's seal, is dragged from his cell by the king's magus, who is on a quest. The prize is Hamiathes's Gift, said to be a creation of the gods that confers the right of rule on the wearer. During the quest, the magus and Gen take turns telling the youngest member of their party myths about the Eddisian god of thieves. Turner does a phenomenal job of creating real people to range through her well-plotted, evenly paced story. No one is entirely evil or completely perfect. Gen is totally human in his lack of discipline, seeming lack of heroism, and need for sleep and food. The magus makes the transition from smug, superior scholar to decent guy in a believable fashion. Turner also does a neat job of puncturing lots of little prejudices. There are many deft lessons in this story. As absorbing as it is, the best part lies in the surprise ending. Though it is foreshadowed throughout, it is not obvious?its impact is more like morning sunlight than a lightning bolt. This book is sure to be a hot item with adventure and fantasy lovers, and YAs who like snide, quick-tempered, softhearted heroes will love Gen.? What a surprise this book is. .. and what a very good writer the author is! 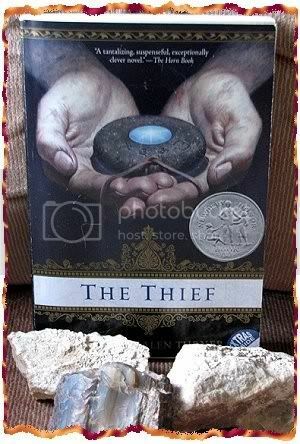 I realize this book was read by many quite some time ago and I've had it in my tbr pile for a long time. Wanting something short to read I picked this book out and wondered why I left it there so long. I was to find out at the very end that there are 2 more books out following this one, (which is most likely the reason I didn't read it right away) but as much as I enjoyed this book I don't think I will be getting them. I know, strange thing to say, well.. I went and read the amazon review of the other two books and they get more into "war" and such and since this book concluded itself fairly well I think I will forgo the other. Having said that I would still recommend this book! I loved the main character of Gen. There is just enough humor in him to carry the whole book. I also liked the magus and the other characters that took the journey with Gen.. and the surprise twists at the end of the book! I really did like the book and I think others will enjoy it too and would probably read the two books that follow. This was an enjoyable read. It made it more pleasant by having a slightly larger print than most books and double spaced. It is a quick read aimed at YA that like a little magic mixed in with an evil villain that needs to be exterminated in order to save the world. I'm afraid I didn't enjoy this as much as I could have had I not been coming off of reading the Guernsey Literary and Potato Peel Pie Society which was so good I didn't want it to end! When you come from reading a book you really, really liked (especially when you didn't expect to like it THAT much!) it's hard to wrap your head into whatever is the next book you pick up. Actually this book was probably good in that respect since it was a simple read. The character of Skulduggery was good, though they never explain how he became alive again after he was dead.. but then again it was probably due to "magic". 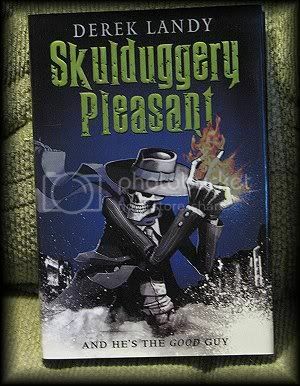 This is a book that I think young people will enjoy, good characters and a good basic story.. and there are a number of Skulduggery Pleasant books out there!